There are many stories in the news regarding individuals who have received a telegram from the Queen but not everyone is entirely sure as to why this might be. Is it simply because they have reached the age of 100? The monarch has been sending telegrams relating to specific events since 1917; the purpose of which is to celebrate and mark in some special way the fact that a milestone age or anniversary has been reached in an individual or couple’s life. How Do I Qualify for a Telegram from the Queen? You will qualify for a telegram from the Queen if you are one hundred years old. All centenarians receive a telegram and this is arranged and carried out by the Anniversaries office, which is part of the Queen’s private staff. You will also receive a telegram from her Majesty once you reach the age of one hundred and five and every year after that you will receive one as well. Couples celebrating specific anniversaries also qualify for a telegram from the Queen and indeed within these couples there may well be a centenarian who is also celebrating their one hundredth birthday. Wedding anniversaries are marked by the Queen and the Anniversaries Office once a couple have reached their diamond wedding anniversary; a diamond anniversary marks a 60th year of marriage and a telegram is received. However unlike the telegram received to mark a centenarian’s birthday an application must be made by the family of the couple celebrating their wedding anniversary. In addition a telegram will be sent on the 65th wedding anniversary and on the 70th wedding anniversary and every year after that. How Does The Anniversaries Office Know it's my Birthday? This information is provided to the Anniversaries Office via the Pensions service who will have all the information relating to the dates of births of anyone nearing or having reached the age of one hundred. However as we have already mentioned the Pensions service do not have information relating to wedding anniversaries so it is up to the couples themselves or their families to inform the Queen's private secretary of such upcoming events. How Do I Apply for a Telegram? You can do this by visiting the Royal Family’s website at www.royal.gov.uk or by contacting the Chief Clerk at Buckingham Palace – the address to do so can be found on the website address listed. 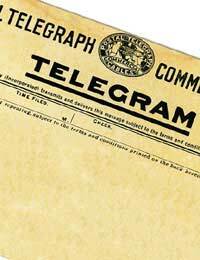 Why Receiving a Telegram is Something Special? Receiving a telegram from the monarch is considered a special event because it marks a milestone in the lives of those individuals who receive them. Unfortunately the demographic of the population is such at the moment that the number of centenarians is dropping in number so to reach the age to receive one is something special in itself. The other reason receiving a telegram from the Queen is special is because it is something that not everyone receives. The purpose of the telegram is to highlight the life of the individual receiving it and also to highlight the fact that these individuals have played an important part in the history of the United Kingdom. I am trying to find an Auntie I have payed for a search turn up nothing and no death. She was born Ruth William 7/7/1912 in Devonport. I wonder if I could find out if she received a card from the Queen, is there anyway I can find out. Hi, just wondering if you can help me. My nan 95 and currently has been given days. The family are taking it in turn to sit with her night and day. Her one thing was to see her grandchildren get married and get a letter from the queen at 100. At this point we know she will not make it. Would you please help us with if possibly sending a note of some sort so at least we know she got something. You could try contacting The Palace and making the request but they do usually only send them for centenarians and every fifth birthday thereafter. My great grandmother is extremly unwell and her dying wish has always been to have the telegram from the queen. She is 98 and 99 in December. Is there anything I can do? Any help would be appreciated. Many thanks. Hi my grandmother Peggy Phillips is turning 100 on the 27th September 2017. She currently lives in South Africa. What do I have to do to get a letter from the queen? I have been friends with a Greek Cypryot lady who will be 100 on 20th August 2017 she has lived in England since her early twenties will she receive a telegram from the Queen ? If so when do I apply ?